The classic card game that is as easy to learn as rummy, yet infinitely more challenging. Combining strategy, chance, bluff and surprise, Mhing is fast moving and fun to play with friends and family. Experience the excitement as each player strives to be the first to go Mhing by combining special sets of cards. Taste the satisfaction of putting together those rare combinations that give the highest score - but never forget to watch the other players who can quickly surge from behind as the fortunes change with every hand. 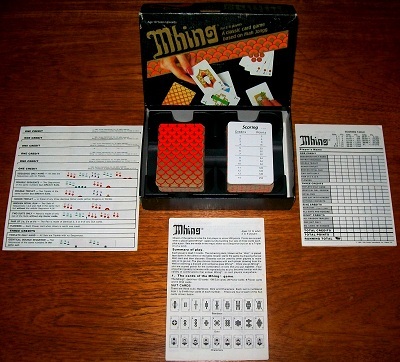 If you've ever wondered why Mah Jongg has lasted for thirty centuries and is acclaimed as one of the most successful games of all time - try Mhing! This game is complete and presents itself in excellent condition. The box shows only very minor signs of storage wear and the contents are immaculate. Every card is in mint condition; the rule booklet, reference sheets and card tray are all in brilliant condition; and a generous complement of scoring sheets is provided.